The ladies and gents behind Calgary’s 30th Folk Fest don’t seem all that concerned with folk music. Instead of pulling together endless sets of acoustic guitar, they’ve recruited 60-plus acts from all over the map – both musically and geographically – to perform this weekend, including hip-hop forefathers, blues legends, emerging country singers and more. To ensure that you balance the known quantities with the up-and-comers, we’ve assembled this handy “If…then” guide to Folk Fest. Don’t leave home without it. If you dig the decisive strumming and old wolves calls of blues legend Corey Harris, then check out Edmonton’s Kat Danser. Her lively contralto, driving percussion and hypnotic lap steel will sand down the rough, leaving you with smoothly polished Delta Blues. 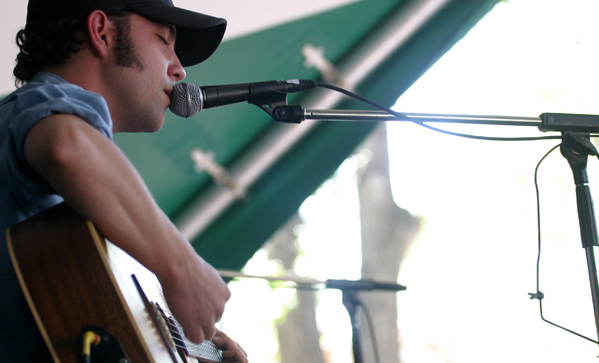 If you dig the haunting, ethereal lyrics of Sam Beam’s Iron & Wine, then check out the whisky-soaked sounds of 30-year-old Ontario troubadour Justin Rutledge (pictured above, at a past festival) who’s drawn comparisons to the legendary Townes Van Zandt. If you dig the no-borders instrumental mash-ups and inspired throaty croaks of Calgary’s Chad VanGaalen, then check out Brooklyn’s Akron/Family. Their experimental three-part vocal harmonies transcend the church and offer a mind-blowing freak-folk religious experience of their own. If you dig the conscious, Afrocentric rhymes of Atlanta’s legendary Arrested Development, then check out their improvised collaboration with Kid Koala, Mutabaruka and Calgary’s own dynamic hip hop duo Dragon Fli Empire, whose matter-of-fact lyrics play over big fat fuzzy beats. For showtimes, click on artists’ names. Image courtesy of Frank Gasparik.